Every city of the world has its rich history, legends, unique architecture, attractions that are interesting for tourists, and the guides that will help you to turn a walk around the city in a short time travel. We provide services of trained and certified guides-translators, who have rich experience and knowledge about sights and history. The guides of the company “Triumph SAT group travel” conduct their excursions at ease, where you will not only spend a good time, but also learn a lot of new things. Excursions are created taking into account all the wishes and preferences of the guests of the city. You can choose a tour for your budget and at a time convenient for you. We work with individual tourists and with groups. Pedestrian excursions are held at a convenient pace for you, and car tours – on comfortable cars or minibuses. Our guides constantly conduct excursions, both in Russian and Kazakh languages, and in English, and have rich experience and knowledge about sights and history. Hello! 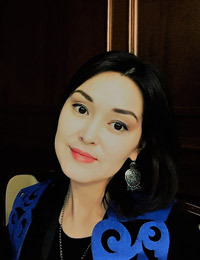 I am Rakhimzhanova Assel, a certified Russian-speaking guide of Astana city. Astana is like a flower, grew and blossomed in the midst of a hot steppe. And today the capital of our country is a unique symbiosis of West and East traditions, new and history, venturousness and rationality. Astana is a city where the opportunities of modern architecture were demonstrated. The most advanced technologies and innovative methods of urban development art of the 21st century were used in the construction of the city and in changing its appearance. The World-famous architects turned their best projects in reality in Astana. I invite you to visit one of the youngest capitals of the world, where you will see its beautiful sights! Hello! My name is Sarmuldinova Indira, I am a certified English – speaking guide of Astana city. Today our capital has objects to be proud of: “Baiterek” – a symbol of creation, independence and prosperity of a sovereign state, where you can admire the city growing in the steppe from a height of 97 meters. The pyramid – the Palace of Peace and Accord – is known far beyond our country, and not only because it has become a place where irreconcilable parties have gathered together, but also because of its tourist attractiveness. An amazing architecture of the left bank, and the uniqueness of each building separately – Akorda, SEC “Khan Shatyr”, the Opera and Ballet Theater “Astana-Opera”, etc. I invite you to a city tour around my favorite city! Life during traveling is a dream in its pure form. Agatha Christie. Ni Hao! 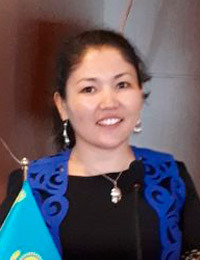 My name is Talap Aizhan, I am a certified Chinese and Kazakh speaking guide in Astana, manager of domestic and inbound tourism. Modern Kazakhstan attracts tourists by a wide variety of excursions and programs: the famous high-mountainous ice rink Medeo, the world’s first cosmodrome Baikonur, the grandiose canyon Charyn – similar to the American Grand Canyon, the ancient cities of Taraz, Shymkent and Turkestan, one of the young capitals of the world Astana, felt yurts, kumys, boundless steppes – Kazakhstan will be remembered to you by the bright and peculiar culture of nomads. Welcome to Kazakhstan!